Hong Kong Art Center last night held the "Louis Koo Cinema" naming ceremony. Koo Tin Lok was unable to attend due to work but sent a video to show his support. MEN ON THE DRAGON (YIK LAU DAI SHOOK), TRACEY (CHUI SZE) and THROWDOWN (YAU DOH LUNG FU BONG) will be screened at the cinema. MEN ON THE DRAGON's Jennifer Yu Heung Yi, Tony Wu Tsz Tung and director Sunny Chan Wing Sun attended the ceremony. 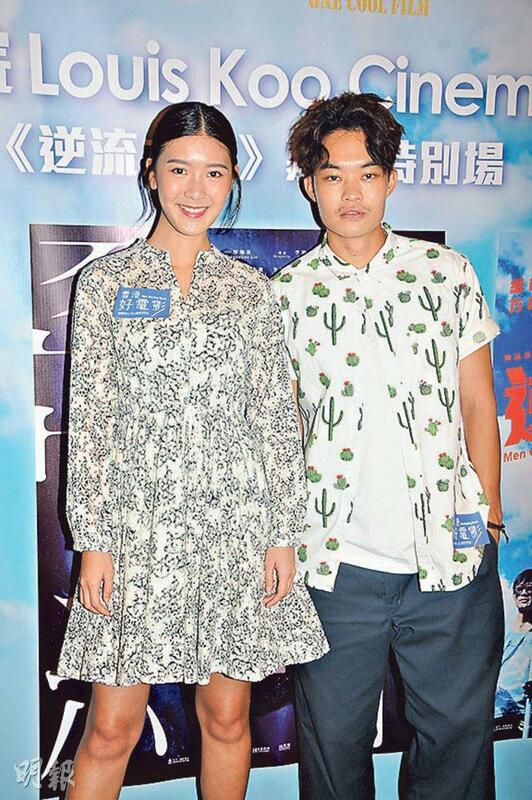 Yu Heung Yi made her first public appearance after her break up with Carlos Chan Ka Lok. She said that she has been busy with work as she attended film festivals in Malaysia, Taiwan and New York. She said, "The team has been great, in Malaysia they treated me to durian, in Taiwan and New York we also kept enjoying great food. I stayed a few more days in the U.S. Because I wanted to study drama in New York, I wanted to familiarize myself with the environment first." Yu Heung Yi denied that she wanted to escape from the "land of heart break" but those around her were worried. "I told Mama I was taking diving lessons, she was afraid that I would do something silly and talked me out of it. (Any chance of getting back together?) For now I don't want to think too much about it. Work is the most important. Ka Lok and I are in contact. We exchanged pleasantries." Wu Tze Tung said for MEN ON THE DRAGON to premiere at a Koo Tin Lok sponsored cinema, he was very happy. "What Koo Tin Lok has done is very encouraging for the entire film world." He hoped that his family, friend and girlfriend Stephanie Au Hoi Shun would show their support.